This evening we grilled steaks for dinner. When we were shopping at Costco this afternoon, I initially picked up a package of tenderloin steaks (filet mignon) and then remembered that not long ago I tried a different cut of steak that I found there that was as good, if not better, than filet mignon and they cost half the price per pound. That's a win/win in my book! The steaks I prepared this evening are Beef Loin Top Sirloin Cap Steaks (it's a mouthful, I know). They are sometimes referred to as Coulotte Steaks. It's a fairly lean cut of steak but extremely tender, moist and flavorful. 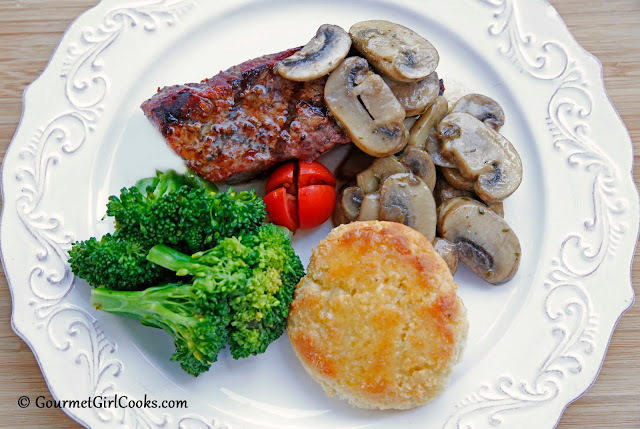 They have the tenderness of filet mignon and the flavor of sirloin...a match made in heaven! At my Costco, they are $7.39/lb which is half the cost of their filet mignon and I actually prefer these. I've used this steak to make Beef Kebabs with too and they work perfectly. If you can't find this particular cut, you can use whatever your favorite cut of steak is. I kept things simple and seasoned the steaks with McCormick's Chipotle & Garlic Seasoning and right before plating the steaks, I added a pat of Kerrygold butter to melt over top. It adds a wonderful flavor to them. I also topped them with thickly sliced fresh mushrooms sauteed in a bit of butter. I served steamed fresh broccoli and Parmesan Biscuits alongside our meal (the guys also had baked potatoes with theirs). It's amazing how something so simple can taste so good. I snapped a photo below and included the easy peasy recipe. Enjoy! Preheat grill to 400-450 degrees. Season both sides of steak with seasoning or salt and pepper, to taste. Place on hot grill; cover grill and cook about 2 minutes, then turn half turn (on same side) and cook an additional 2 minutes. Turn steaks and repeat on the other side for 4 minutes or until desired doneness. Transfer to a platter and cover with foil and allow to sit about 10 minutes to help retain juices. When plating steaks, place a pat of butter on top of each. Top with cooked mushrooms, if desired. Thank you so much for all of your fantastic recipes! My husband and I have been following a low carb/Paleo diet since February. Your recipes have kept me motivated and I look forward to reading your blog each day!